During your tour, our guides have the ability to present marine wildlife encounters and photo opportunities with whales comfortably in the Monterey Bay. Here is some information on the whales you will see in the Monterey Bay. The whales are heading south from their known feeding grounds off of Alaska traveling to their birthing area off of Mexico. These whales have one of the longest migrations of any land or marine mammal, traveling more than 12,000 miles, streaming predictably by Monterey in November through to May, when they are headed back north for feeding again. 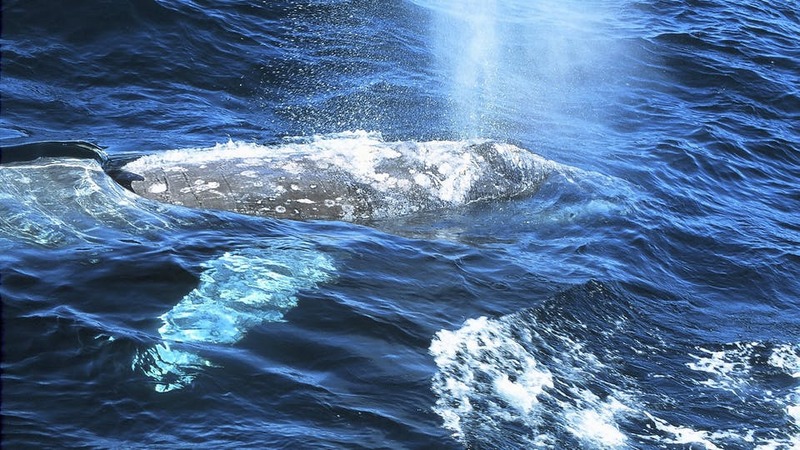 Gray whales tend to swim along at a slow speed coming up to shoot their billowy blow (see picture) into the air and show off their fluke (tail) as they take a dive that usually only lasts for 3-5 minutes. Some of the most spectacular sights to see with Gray whales is when they begin to have interactions with other species such as the dolphins. For some crazy unknown reason the dolphins can set the gray whales into a rolling frenzy and the whales begin to gather in larger and larger groups. Sometimes as many as 10-15 animals in a pod! What happens next is a mystery but the dolphins seem to harass and surround the whales, riding off of their large heads and buzz (echo Locate) off the huge sensitive whales bodies. In response to these swarming dolphins the whales begin to roll over putting their bellies and chins to the sky and swish their flukes as if to shake the dolphins off of them. Lifespan: At least 70 years or more. Distribution: Remaining populations of Gray whales are in the North Pacific but the last 100 animals on the far west most likely will go extinct. They are shallow, near shore, and offshore migrating from off of Mexico to the Beaufort, Bering, and Chukchi Seas. Diet: Benthic amphipods are the primary diet. Adults: Adult females are slightly larger than adult males. Not only are they huge, they are the second largest whale in the world, but they are built like a torpedo and are so powerful that a few swishes of their fluke can propel them over 30 mph to lunge after their favorite prey being schooling fish. It is not uncommon to see these whales raise up and take off from gorging in our waters when there are Killer whales in the area and what a site that is. Killer whales, or Orca, are the only known predator to the fin whales and the Orca’s can reach speeds of up to 40 mph!!! 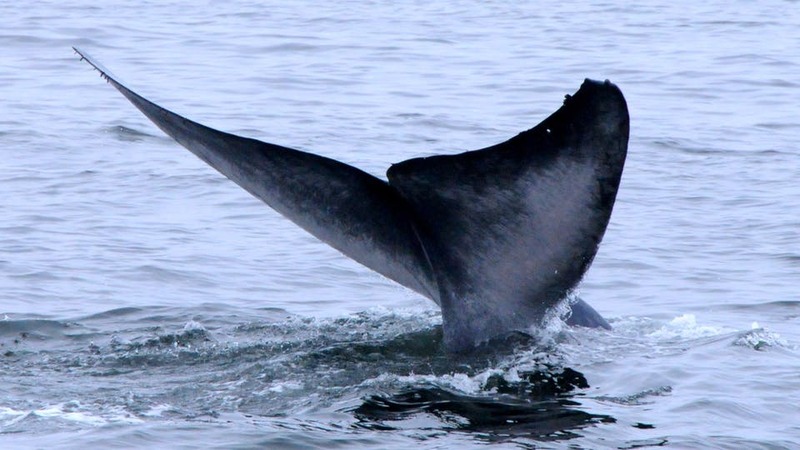 Fin whales Might look a bit like the Big Blue whales but they have some beautiful body markings that give them away. 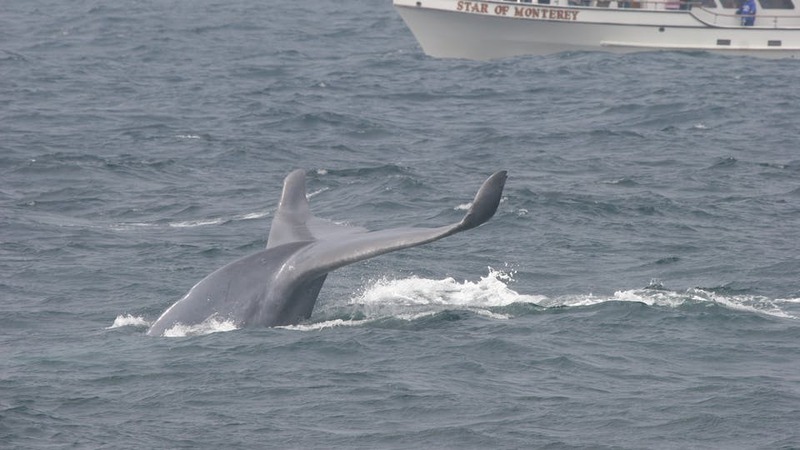 Fin whales wear a white to grayish veil, (scientists use the term chevron and the blaze) that creates an abstract “V” shape on the back of the head that usually merges into a swirl as it drops to the lower right jaw that turns into a pure white lip. Each animals marking are totally unique. 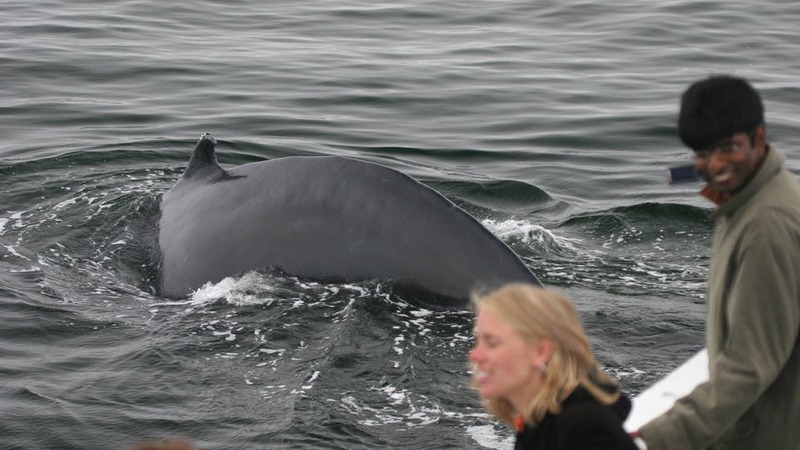 The left side of the fin whales face and lip are still dark gray to almost black! Researchers suggest that this lighter right jaw and lip aids the whales to catch their prey. When fin whales role with their right white lip towards the prey it actually helps to camouflage and allow the whales to engulf even more prey with every bite. Lifespan: More than 70 years. Population: Numbers indicate they are recovering after whaling. Distribution: Worldwide, temperate to polar latitudes and can be seen in coastal, shelf, and deep open ocean waters. Diet: Small schooling fish and krill. Group Size: 3 – 7 and up to 100 in feeding groups. Nothing is or has ever been as big as the Giant blue whale getting up to 110 ft long and 400,000 lb. When these big girls give birth to their 23-26 ft long calves they nurse them as much as 50 gallons a day so the calves can gain up to 200 lb. (90 kg) a day!! Before these calves are weaned they have grown two thirds of their adult length of as much as 50 ft long in the first year of life. The largest population of Blue whales work the waters in Monterey Bay to feast on the abundance of krill and the biggest whales can consume up to 12,000 lb of food a DAY. They are able to fill their mouth and throat grooves with several tons of tasty prey every time they take a gulping lunge. (see picture) To get some perspective and give you a mental picture of their size, the eye ball is the size of a basket ball. Their heart is the size of a V.W. bug automobile and they are equivalent to 30 elephants. Distribution: Over the shelf of the Monterey submarine canyon, but mostly off shore in deep water migrating from tropical waters to polar world waters. Diet: Several species of krill. Group Size: 1-2 Unless there is great concentrations of prey. These whales are a mystery because this population disappears in the winter months and no body knows where they go! Minke’s all over the world behave differently. The Minke whales here tend to be a little illusive except when they are invested in feeding activities and that’s when we get our best viewing. These whales love to dine on our baby rock fish schools. The Minke whale happens to be the smallest baleen whale out of 5 main species that come into our area and compared to body size they are really quite petite. They average in length of about 23 ft, in our area, when other Minke’s are better known to reach lengths of about 30 ft.These whales have some interesting color patterns on their bodies that are key for identifying them. Minke whales are dark grey and have a pure white colorless patch running across their front pectoral fins as if they are wearing white arm bands varying in width from individual to individual. Sometimes you can even see a very pale light colored veil sweeping behind their heads in a “V” shape pattern. It is refereed to as the chevron pattern. As far as seeing more of this whale you could be on one of the lucky trips when one breaches (jumps) or spy hops out of the water. I can’t miss lead you and say it happens all the time but when it does you’ll just about drop to the deck with excitement!! Lifespan: More than 50 years. Population: They are one of the most abundant whales, however, reliable information on population size is unavailable. Distribution: Near shore shallow to open ocean and found world wide. Migrations are variable amongst populations. Group Size: 1 – 3, large groups if prey is plentiful.